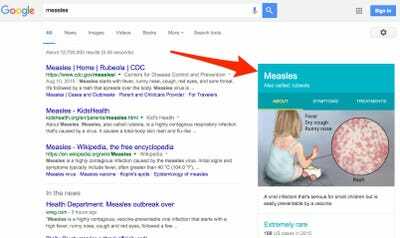 GoogleAn example of what a Google health symptoms search will look like. Right now when you search Google for your latest and not-so-greatest medical symptoms, you get a hodgepodge of results that leaves you wondering if you might be on the verge of death. (When in fact you have, say, a cold). 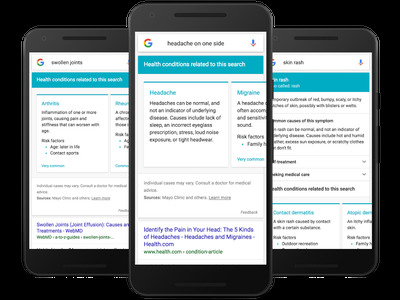 When you search Google for your latest medical symptoms — from skin rashes to headaches — it will play doctor and tell you what you might have. 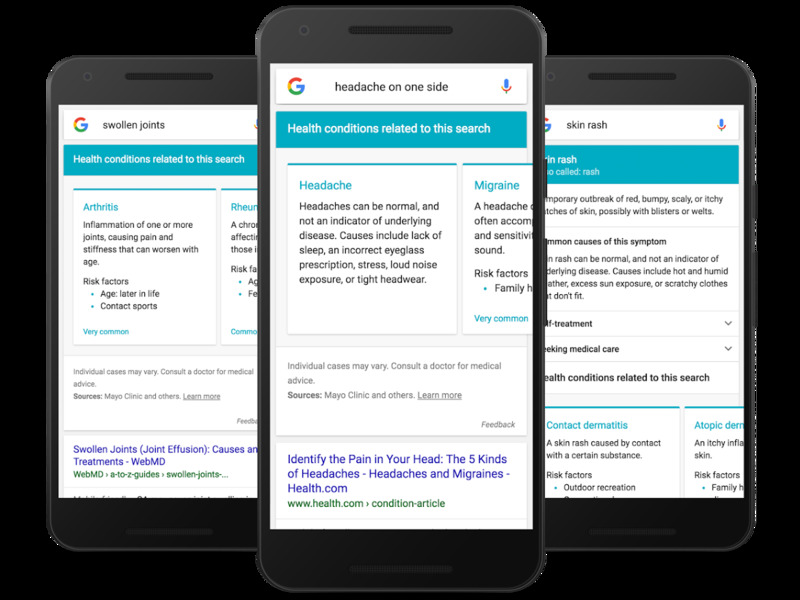 Google partnered with Mayo Clinic and Harvard Medical School to come up with common symptoms people search and what ailments they could be afflicted with. Apparently 1% of Google searches are for symptoms, Veronica Pinchin, a product manager for the company, wrote in a blog post announcing the new feature. That may sound small, but it translates to millions of searches. We tried a few symptom searches on Google Chrome and the Google App in Android, but it doesn’t look like the feature is active yet. The company said it would roll out an update to the mobile app in English in the US to start in the next few days. Of course, even though this information has been checked by medical professionals, Google says it shouldn’t be all you do to determine if you have a medical issue. “Symptom search (like all medical information on Google) is intended for informational purposes only, and you should always consult a doctor for medical advice,” Pinchin writes in the blog post. It will be interesting to see how people end up using the feature, and how reliable Dr. Google will be.